WWLJD – What Would Lil’ Jesus Do? Only he’s 2 feet shorter?! What the heck? I picked up this little Jesus from the Dollar Tree a long time ago. 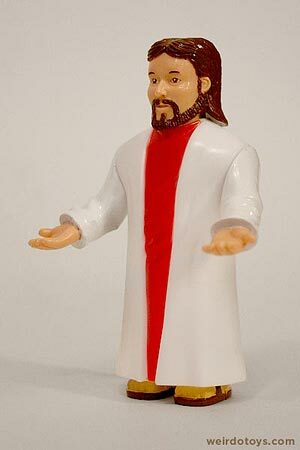 He was one of a series of biblical figures (maybe I’ll feature the other ones some other day). All of them were squatty for some reason (that’s pretty much why I bought ’em… cuz they were just so goofy looking). He’s returned with a mullet now too? C’mon! Each figure also came with a small plastic sheet with an illustration on it (kind of a cheapy version of a diorama). 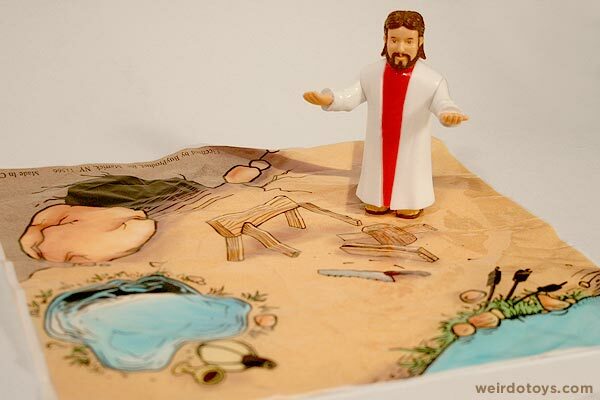 I wish I still had the sheets, because Jesus’ “scene” depicted a few infamous scenarios. 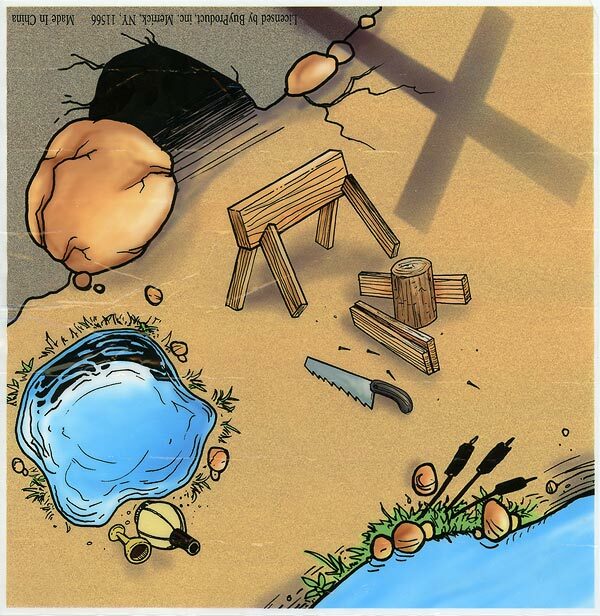 First, there was his tomb with a huge boulder rolled away. But what made it great was the fact that right outside the tomb there was a saw horse with a hand saw and wood… you know.. depicting the fact that he was a carpenter (good to know he had such a committed work ethic… getting right to work after rising from the dead). And lastly, there was a little basket full of loaves of bread and bundles of fish (in case he’s hungry after all that wood cutting). 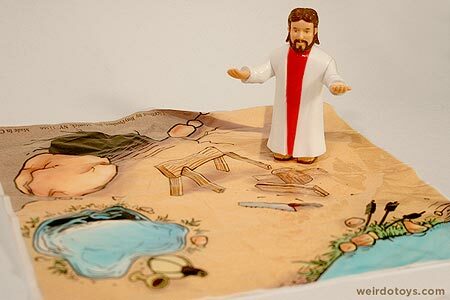 If I miraculously find Jesus’ little diorama sheet, I’ll post it here. Holy moley! I was going through some boxes recently and I stumbled upon that little plastic sheet scenery I had mentioned earlier. I thought I’d lost it. I see my memory of the scene was a bit inaccurate. Turns out I had mistaken the “loaves and fishes” story with the “water to wine” story… which actually makes the scene even funnier. It’s complete with pond, chalice and wine bottle. 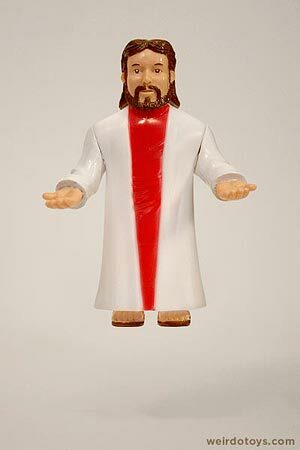 Now it looks like Jesus rose from the tomb, did a bit of woodworking and finished up by pouring himself a drink. One thing I didn’t recall from the scene was the dark, looming shadow of the cross. Kinda creepy. Lastly, there’s some legal info on the scenery sheet that can give us a bit of insight to where this toy is from. The legal copy reads: “Licensed by BuyProduct, Inc. Merrick, NY 11566 Made in China.” I wasn’t able to find anything new. Thanks! I try. Sometimes I luck out with extra time, and sometimes I come across an easy toy. So, being a carpenter… do you think he built his own cross? Yeah I remember these. I found them at dollar tree as well and quickly snapped them all up. I kind of forget which ones there were now, there was moses mary and Jesus right? were there any others? And speaking of dollar tree have you ever been to a dollar zone? I have a crap ton of these really great poorly made motu ripoff guys from there. If You are interested I could send you some pictures of them in all there crappily made glory. 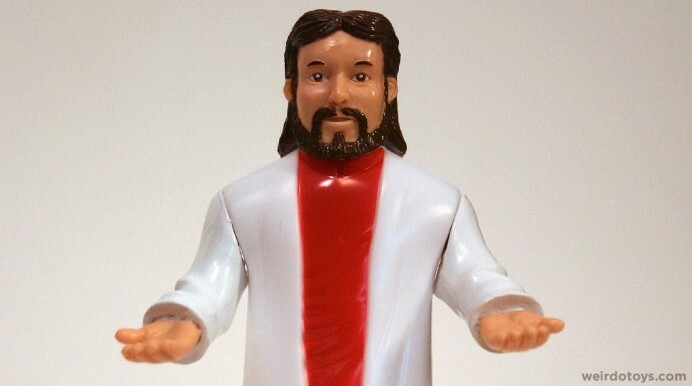 And, yeah, there were Joseph, Mary and Noah figures in the set too. Maybe they’ll make it to the blog someday. I had a Noah figure when I lived on the West Coast. Man that thing was wretched. Sadly Noah and his ark were left behind in a previous move. 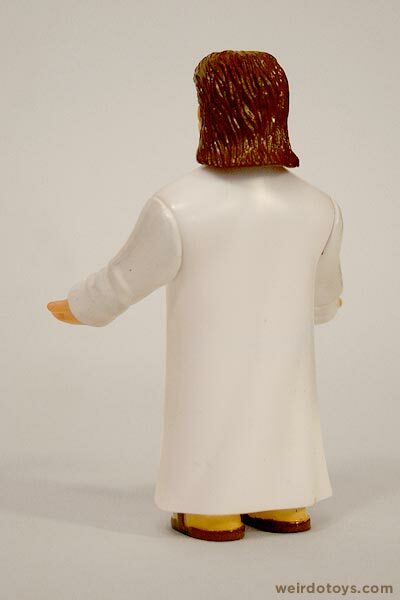 I have a figure from a set called “Black People”. I got it from a friend who had the entire set which came in a single box. So he basically broke his set to give me this one. I can’t remember what the other figures were depicted doing, but the one I have is a little boy eating a watermelon. It is actually a well made piece for being dollar store bought. It is my favorite toy/figurine I own. It and the others were only 2″ and shorter. Mine is about 1.5″ cause the boy is sitting on a tree stump and has a whole melon at his feet and a slice in his hands. Your Jesus reminds me of him because of the surroundings included. I love how he looks like he’s floating in the first pic. Also, you enjoy humor in a religious vein, you may enjoy my art!